Rakusan did not include the Fan Series in his main sequence numbering. Therefore, the original number used for each of the 36 Series prints has been modified to identify the Fan Series members of its theme. The five different fan silhouette shapes have been here assigned arbitrary numbers 1 through 5. To indicate a fan design these shape designations are added to the 36 Series number separated by a hyphen. 130-5 is the Fan Series design with fan shape 5 in the 130 Cherry theme. Like all other designs in this series, 130-5 was only produced in a single print run, and few copies are currently documented. The 130 Cherry theme is one of the many entirely regular themes represented by a complete fan quintet and a color woodblock print. The Fan Series prints of the 130 Cherry theme were distributed in early 1935 in installment ten (of twelve), but the delivery documents for installment ten remain to be discovered. The series as originally announced would have seen this installment published in October 1934. However, with documented delays the earliest month it could actually have been delivered is January 1935, and it may well have been even further delayed. Four of the five fan designs in this theme (including 130-5) and the 36 Series design 130 have seal C which indicates a carving date during the first half of 1934. Despite the early completion of most of its wooden blocks, Rakusan delayed printing and distribution of the prints in what became the 130 Cherry theme until the following year. It was eventually grouped with other spring season themes nearer to the end of the series. Use of seal B on 130-3 suggests it was carved somewhat later than the other designs. A minimum of three different kinds of cherry are shown in 130 Cherry theme designs. The flowers in 130, 130-1, and 130-3 are double; in 130-2 and 130-4 they are single; and in 130-5 they are also single and in addition this is the only weeping form. Therefore, the theme subject cannot be expressed as any particular variety of cherry. At least some of the cherry designs in this theme were adapted from sketches originally created in the late 1920s during the planning of designs 3, 88, 87, and 67 in the earlier 100 Series (see below). 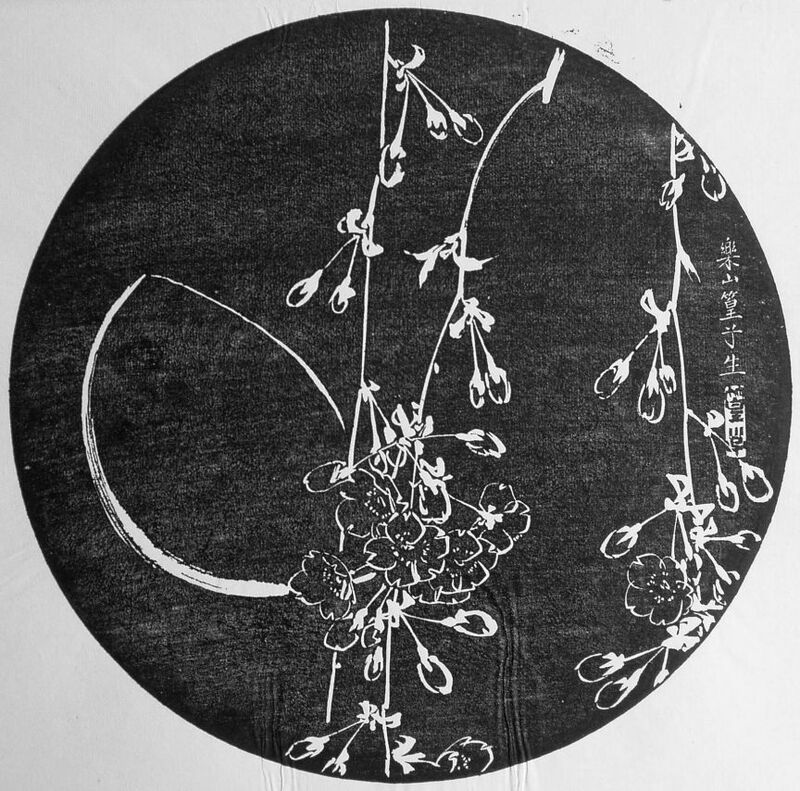 The composition of 130-5 includes three pendant blooming branches of weeping cherry in front of a waning gibbous moon. Most of the flowers are still in bud, but a few have opened. 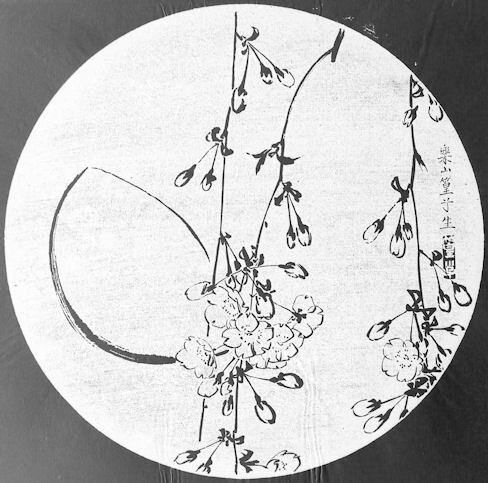 The cherry is rendered as a detailed line drawing which looks equally well as ishizuri or reversed, and the moon consists only of simple arcs. 130-5 is the only known Rakusan artwork which includes the moon or indeed any other heavenly body. In Japanese the general name for any cherry is 桜 (or older style 櫻), さくら, サクラ, sakura. Rakusan described the cherry variety in 67 as しだれ桜 , shidare-zakura, lit. 'weeping (pendulous) cherry' which today is popularly applied to any cherry with a weeping habit. As with many old cherry cultivars, the species identifications of Japanese Weeping Cherry, 枝垂桜, (枝)垂れ桜, しだれ桜, しだれざくら, シダレザクラ, shidare-zakura, is open to dispute. The variety originated in Japan and is unknown in the wild. In the West weeping cherry is often described as Prunus x subhirtella (a hybrid between P. incisa and P. spachiana). Because that cross includes non-weeping cultivars, the varietal name pendula is frequently added to describe the selected weeping forms. Although Rakusan illustrates a pink semi-double form, the blossoms of weeping cherry cultivars vary from white to pink and single to fully double. Sometimes weeping cherry is considered a form of Prunus spachiana.